Congressional candidate Dave Evans, right, talks about issues with Col. Jim Stone at a "Meet and Greet" Thursday at Fine Swine Bar-B-Q. 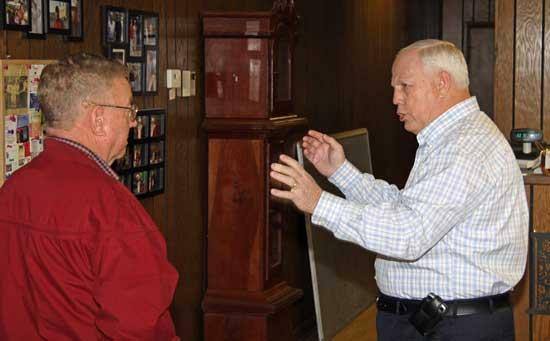 There are many reasons Dave Evans is running to become Cannon County's next representative in the United State Congress, but the one he emphasized the most Thursday was his desire to be the voice for its citizens in Washington. Evans held a "Meet and Greet" at Fine Swine Bar-B-Q Thursday, during which he discussed what motivated his race to become Tennessee's next Sixth District Congressman, and what he wanted to accomplish if he is elected. Evans, who described himself as a "Christian, Conservative and Patriot" said he is not running to represent a political party. Rather, he is running to represent the citizens of the Sixth District and to fight for the causes which are important to them. "This election should not be about party politics," Evans, who is running as a Republican, said. "It should be about us as Americans and what is best for our country." While Evans may be the least well-known of the candidates vying for the seat currently held by Bart Gordon, he may also be the one most committed to serving those who would elect him to office. "I'm doing it (running) from the heart, to get the people's interests represented in Washington," he said. "Their voice has not been heard there for a long time." Evans said the election of a conservative to the Senate seat in heavily liberal Massachusetts this week could be a harbinger of a new political direction for the country. "I think that it (the Massachusetts election) is an indication of people's anger about the direction of this country," Evans said. "I think it sends a big message that people are the ones that elect our representatives and that no person or party is entitled to a seat in government." Evans said his candidacy is about restoring America to the way it has been, and the principals on which it was founded. "I'm just a country boy. What you see is what you get. I am running because collectively they (current Washington politicians) are not listening to the people. Democrats and Republicans alike a trampling on the Constitution. Among the issues Evans addressed during his speech were taxation, the economy, national security, foreign policy and ethics in government. "If you didn't have to pay more taxes you would have more money in your pocket," Evans said. "I think it (increasing taxes) is being done on purpose to grow government and in turn grow the dependence of people on government." To learn more about Evans and his stances on the issues, visit DaveEvansForCongress.com.